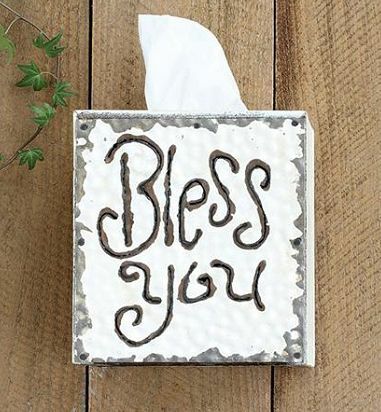 This "Bless You" Tissue Cox Cover from Creative Co-Op will be a great unique decorative accessory item for your bathroom or home decor. It is constructed from wood and tin metal and features a distressed white finish. It measures 6" Square x 6-1/2"H.
The beautiful rustic design of this tissue box cover features the words "Bless You" etched through the metal on the front side. Two sides feature a heart motif as shown in the picture on the left. It will make a great gift for any occasion. Unique Home Decor Bathroom Accessory.